A continuous fixed bed study was carried out by using PAN-oxime-nano Fe2O3 as a sorbent for the removal of nitrate from aqueous solution. The effect of factors, such as flow rate (2, 5 and 7 mL/min) and bed depth (5, 10 and 15 cm) were studied. Data confirmed that the breakthrough curves were dependent on flow rate and bed depth. The adsoption capacities observed in diffent conditions of flow rates (2,5 and 7 mL/min) were 11.65, 24.38 and 25.89, respectively. Thomas model was applied to experimental data to predict the breakthrough curves using linear regression and to determine the characteristic parameters of the packed bed column. Bed depth/service time analysis (BDST) model was used to investigate the effect of bed depth on breakthrough curves. The results showed that Thomas model was suitable for the normal description of breakthrough curve at the experimental condition. The data were in good agreement with BDST model with R2 > 0.98. Statistical analyses were performed on fluoride removal obtained from different flow rates using SPSS16 software by applying Kruskal- Wallis test. 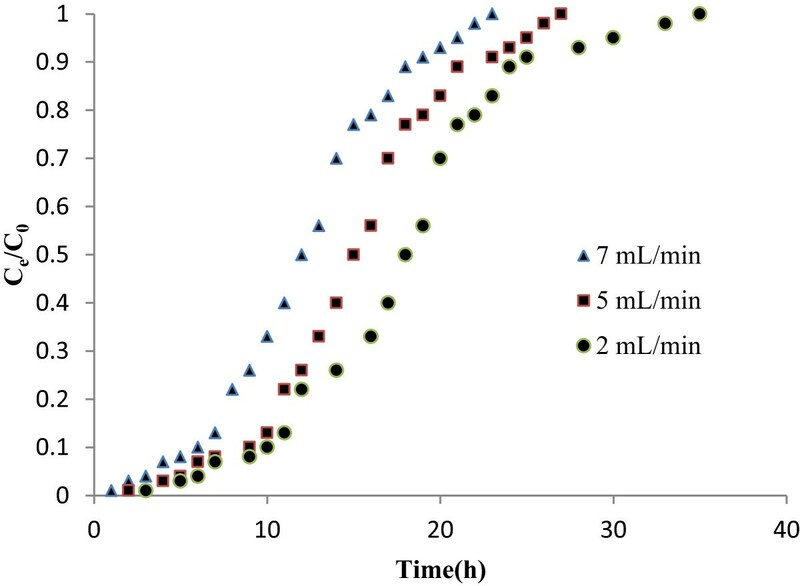 These findings suggested that PAN-oxime-nano Fe2O3 in the column structure presents a great potential in removal of nitrate from aqueous solutions. The principal sources of nitrogen are from nitrogeneous compounds produced by plant and animals or the mining of sodium nitrate for use in fertilizers, and the atmosphere. The most oxidized form of nitrogen is nitrate NO 3 - [1, 2]. World wide, the average intake of nitrate is about 75 to 100 mg/d, of which approximately 80 to 90 percent comes from vegetables. people on a vegetarian diet may consume as much as 250 mg/d of nitrate. Accordingly, drinking water accounts for only 5 to 10 percent of nitrates consumed. However, if the nitrate levels in the water are five times the MCL (10 mg/L), water may supply a person about half the daily diet requirements3. Nitrate is of primary concern for infants younger than 6 months of age. Infants are very susceptible to methemoglobinemia, a condition known as “blue baby syndrome.” High nitrate levels that are reduced in the stomach and/or the saliva of an infant to nitrite cause blue baby syndrome. Nitrite in the blood combines with hemoglobin to form methemoglobin, which reduces the capability of the blood to transport oxygen throughout the body. This results in the skin of a baby turning blue and can be fatal. The present MCL in the United States is 10 mg/L as nitrate and Canada has established a maximum acceptable concentration (MAC) of 10 mg NO3 (N/L). Due to the fact that nitrate is a stable, highly soluble ion, it is difficult to remove by conventional processes. Present technologies for nitrate removal from water supplies include chemical and biological denitrification, reverse osmosis, electrodialysis, ion exchange and adsoprtion. The process of adsorption of the material through of a fluid mixture flowing in to a packed column has gained great interest in recent years. There is a need to carry out the column studies to assess the required contact time for the adsorbate to achieve equilibrium as the results obtained from the batch studies for the contaminants adsorption studies may not be directly applied for field application in the treatment of polluted water. In the present study, PAN-oxime-nano Fe2O3 were used for nitrate removal. Continuous adsorption experiments were conducted to understand and quantify the effect of influencing parameters such as, initial floe rates and bed heights on breakthrough curve. BDST model, which offers a simple approach and rapid prediction of adsorber performance, is applied for modelling adsorption of nitrate in PAN-oxime-nano Fe2O3 column. Hydroxilamine hydrochloride (16 g), sodium carbonate (12 g), and 0.4 g of PAN powder were added to a 250 mL bottle to which 100 mL of deionized water was added and shaken. The reaction was carried out at 70°C for 120 min. After reaction, the resultant was filtered and let to dry. Fe2O3 was coated on PAN functionalized by adding 0.2 g of selected Fe2O3 and 100 mL deionized water in a sealed bottle. The solution was shaken at 70°C for 120 min. The resultant was filtered and dried in a vacuum oven at 60°C. PAN functionalized-Fe2O3 was used as an adsorbent. The characteristics of PAN-oxime-nano Fe2O3 was studied by XRD, FTIR and SEM in our earlier study. Shematic diagram of packed bed column. Where qe is the nitrate adsorbed (mg/g), C0 is the influent nitrate concentration (mg/L) Ce is effluent nitrate concentration (mg/L), Ve is the volume of solution required to reach the exhaustion point (L) and m is the mass of adsorbent (g). Full-scale column operation was designed according to the data collected in laboratory level. Many mathematical models have been used for the evaluation of efficiency and applicability of the column models for full scale operations. 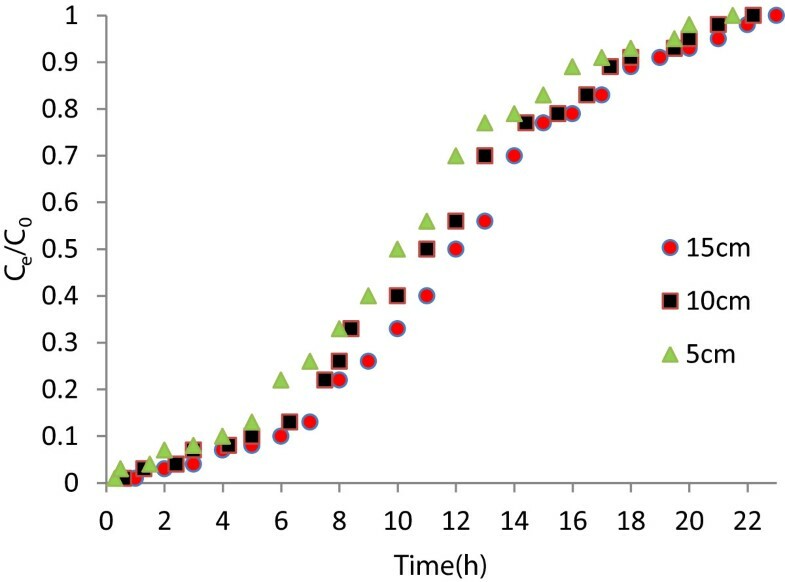 To design a column sorption process it was necessary to predict the breakthrough curve or concentration time profile and sorption capacity of the sorbent for the selected sorbate. Many models have been developed to predict the sorption breakthrough behaviour with high degree of accuracy. In this study the Thomas model was used to evaluate the behaviour of the selected adsorbent-adsorbate system. Adsorption capacity of PAN-oxime-nano Fe2O3 was determined with thomas models. 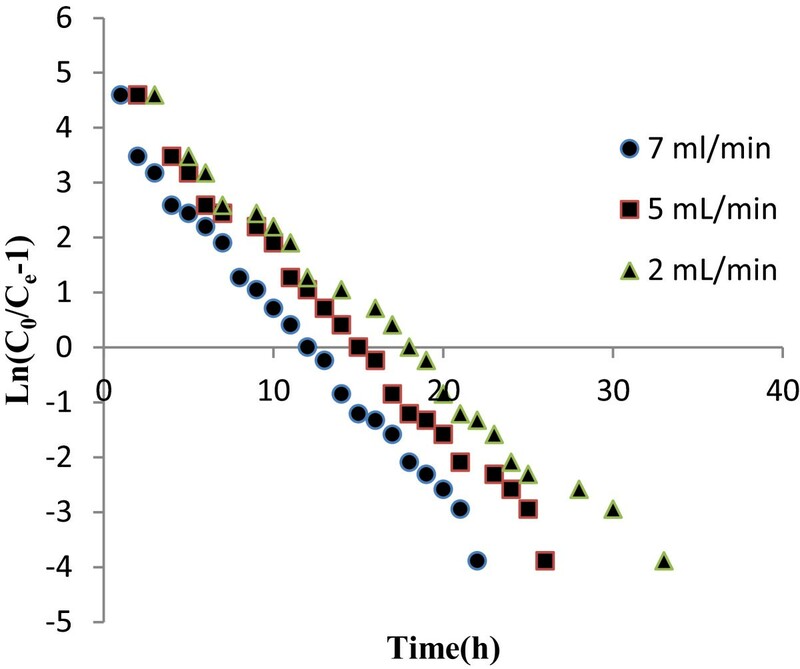 Different volumes of samples containing nitrate (50 mg/L) was passed through the column. The sampling was proceeding until nitrate concentration in outlet reach to nitrate concentration in feed. The adsoption capacities obtained for diffent flow rates(2,5 and 7 mL/min) were 11.65, 24.38 and 25.89, respectively (Tables 1 and2). The maximum adsorption capacity (q0) increased with increase in flow rate. Effect of flow rate on breakthrough curve for nitrate adsorption (bed height 15 cm). Where Ce, C0 = the effluent and inlet solute concentrations (mg/l) at any time (t), qo = the maximum adsorption capacity (mg/g), M = the total mass of the adsorbent (g), Q = volumetric flow rate (mL/h) and Kth = the Thomas rate constant (mL/mg h). The kinetic coefficient, Kth and the adsorption capacity of the bed, qo were determined from the plot of Ln [(C0/Ce)-1] against t at a given flow rate (Figure 3). The model parameters are given in Tables 1 and2. Thomas rate constant, Kth is dependent on flow rate. The adsoption capacities obtained for diffent flow rates (2,5 and 7 mL/min) were 11.65, 24.38 and 25.89, respectively (Tables 1 and2). The maximum adsorption capacity q0 increased with increase in flow rate which indicates that the mass transport resistance decreases. The values of Kth obtained in this research was similar to the ones obtained by other researchers[14, 15]. The Thomas model fitted the experimental data well, with correlation coefficient greater than 0.98, which indicates that the external and internal diffusions are not the rate limiting step. The results obtained from Statistical analysis on fluoride removal in different flow rates is depicted in Tables 1 and2. By the P value calculated (<0.05) it would be concluded that there is a difference among various flow rate tested. With 2 degrees of freedom, a value of Chi-Square as large as 12.84 is likely to occur by chance only 2 times in a thousand (it has a p of 0.002). Thomas kinetic plots for the adsorption of adsorption: Effect of flow rate (bed height 15 cm). Effect of bed height on breakthrough curve for nitrate adsorption on. where C is the breakthrough dye concentration (mg/L), N0 is the sorption capacity of bed (mg/L), υ is the the linear velocity (cm/min) and Ka is the rate constant (L/mg zmin). The values of BDST parameters are presented in Table. 3. The calculated adsorption capacity (N0) and the rate constant (Ka) are 1433 mg/L and 0.0112 L/mg min, respectively. The value of Ka shows the rate of transfer from the fluid phase to the solid phase. When Ka is large even a short bed will avoid breakthrough but as Ka decreases a deeper bed is required to avoid breakthrough. The advantage of the BDST model is that any experimental test can be reliably scaled up to other flow rates without further experimental runs. The column service time was calculated as the time when normalized concentration was reached. 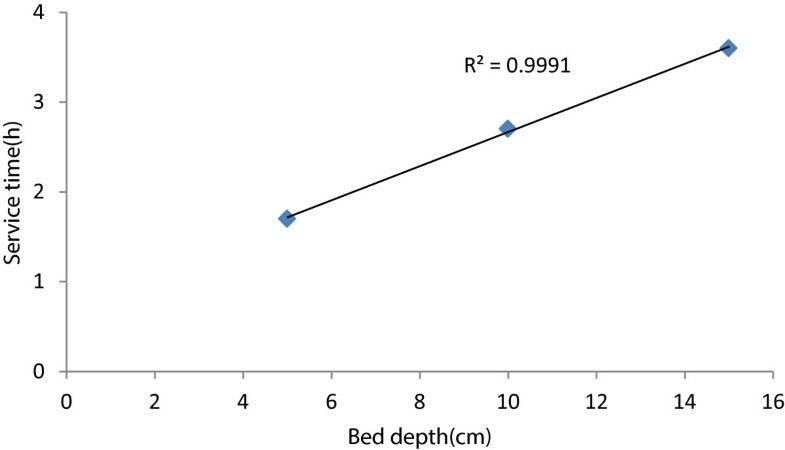 The plot of service time versus bed depth (Figure 5) is linear (R2 = 0.999) indicating the validity of BDST model. Linear Plot of BDST for nitrate adsorption. A good removal of nitrate was observed by fixed-bed by PAN-oxime-nano Fe2O. The adsorption studied showed that at longer bed depth better removal of nitrate would be achieved. The calculated adsorption capacity (N0) and the rate constant (Ka) were 1433 Mg/L and 0.0112 L/mg h, respectively. Thomas and BDST models were successfully used for predicting breakthrough curves for nitrate removal using different flow rates and depth. The application of the BDST model at 10% of breakthrough point gave satisfactory results with an R2 = 0.999. An erratum to this article is available at http://dx.doi.org/10.1186/s40201-014-0120-8. The authors would like to thank the staff of medical sciences research center, Islamic Azad University, Tehran, Iran for their collaboration in this research. MJ, MR and RN participated in design of the column studies and performed experimental procedures. AJ and MJ participated in statistical analysis. MJ and MR drafted the manuscript. All authors read and approved the final manuscript.